We’ve been having a lovely time in Cellardyke these last two days. Yesterday was a very productive day, having put up bedroom lights and pictures on Tuesday evening, we spent the day doing other odds and ends, tidying cupboards, putting up bathroom accessories, sorting out paint and generally drilling and fixing things to other things. In the evening we had neighbours Ian and Yvonne over for dinner, and had a thoroughly lovely time. Today we took a day trip: to Edinburgh. To Currys, in fact, to exchange the fridge for one that actually makes things cold. We hope. Just off now, back to Cellardyke with a fridge and various other bits and pieces. We’re off to Cellardyke for a couple of days, so will be offline for the duration. In fact, not only do we not have a landline telephone connection — as it probably says elsewhere on this blog — we can’t even get a mobile phone signal in the house or garden (other than a very, very weak signal (1/6) if the phone is rested against the left-hand upper pane of the main bedroom right-hand-side window!!). While we’re there I suspect we’ll also see if we can get someone in about the terrible tv signal we get there. I was hoping to upgrade the Taking the Episcopalian website to WordPress 1.5 today before we went. Instead I conquered the galaxy on the side of the CIS in Star Wars Battlefront. With all the news about the the ordination of gay clergy in the SEC just now my appearance in The Herald and the Edinburgh Evening News came and went without comment. A PRIEST has turned to a mobile phone text information service for inspiration for his sermons. Father Gareth Saunders, who serves two parishes in Edinburgh, was converted to the question-and-answer service after it correctly predicted the identity of a new bishop. The 33-year-old cleric now makes many of his church decisions based on the recommendations of the Any Question Answered service. Father Saunders, who serves St Salvador’s in Stenhouse and the Church of the Good Shepherd, Murrayfield, said the service helped him to prepare his sermons by asking it for the location of biblical passages. “It’s an alternative form of divine inspiration, ” he said. A CITY minister has turned to a new text information service for inspiration. The Rev Gareth Saunders, who serves two parishes in Edinburgh, was converted to the question-and-answer service after it correctly predicted the identity of a new bishop. The 33-year-old cleric now makes many of his church decisions based on the Any Question Answered (AQA) recommendations. The service, launched almost a year ago, is used by mobile phone owners across the UK and has already answered more than 200,000 questions. Mr Saunders, who serves St Salvador’s in Stenhouse and The Church of the Good Shepherd, Murrayfield, said the service helped him prepare his sermons. “It’s an alternative form of divine inspiration,” he said. “Often when I’m trying to find factual information to use in my sermons, I will text AQA to ask them the answer. AQA marketing director Steve Bradley said the service was “like Google on a mobile”. I have to say that I wasn’t entirely pleased with the line “The 33-year-old cleric now makes many of his church decisions based on the Any Question Answered (AQA) recommendations.” No I don’t! What kind of integrity would I have if I simply texted all my queries about the church to AQA?! Honestly! the media sometimes. You’ll also notice that they didn’t print the number (63336) or that it costs £1.00 per question. Also, Steve Bradley isn’t the AQA marketing director. Steve is the Senior Associate Director, Sports Marketing and Sponsorship at Hill & Knowlton (UK) Ltd. The AQA marketing director is Paul Cockerton (who, trivia fans, used to be involved with Psion). I feel really sad just now about the state of the Episcopal Church. I’ve just been reading the BBC News, the Scottish Anglican Network, and the Changing Attitudes Scotland websites about the current goings on. I also watched the Reporting Scotland article streamed in RealMedia from their website too. And I just feel sad that there is such upset at the moment, at a time when we should be rejoicing about the fantastic news about Jesus’s resurrection from the dead. On one side of the argument the evangelicals are claiming that they have the truth, that they are right and the liberals are destroying the orthodoxy of the Church, by teaching something that is not biblical. It feels at times as though the evangelicals are trying to maintain the purity of the faith and protect God from these evil human beings who might defile and spoil God. On the other hand the liberals are saying, hey! what’s all the fuss about? The ordination of gay clergy in long-term, loving relationship isn’t tearing apart the church, surely it’s affirming something that is good (love). Surely it is good to open up God’s love to all his people, wasn’t Jesus about breaking down barriers? You know, I really think that neither party holds the whole truth. (Three sides to every story, and all that.) The truth will only come through lovingly listening to one another and holding one another, not with the attitude “I’m right! I have the answer”, but with an attitude of prayer and respect that the Holy Spirit does move and inspire us, and open to being surprised and challenged by God. … there are no clean breaks in the Body of Christ. What is it for the Church to be a truly counter-cultural community? It may be for the Church to take a firm stand against the erosion of objective morality and biblical truth, indeed I believe that this is part of it. It may be for the Church to act courageously on behalf of those who are oppressed or marginalised. Again I believe that is so. But isn’t it the ultimate distinctive counter-cultural fact about the Church our capacity to live sacrificially for the sake of each other? How we do that, Windsor doesn’t tell us. Only the Holy Spirit does. You know what else upsets me? With all this media attention the Scottish Episcopal website has been listed on a number of third-party sites, such as the BBC News one. I’m so embarrassed that we have such a terrible site, and that hundreds of other people will be looking at it, having clicked there from the BBC. 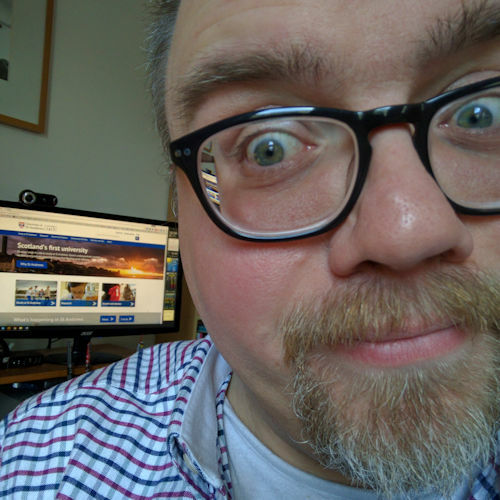 I know, I know … in the midst of all this upset being worried about how the website looks is a bit like standing on the Titanic as it is hurtling towards the iceberg and thinking “Oh, blast! I didn’t polish my shoes!” But I take pride in well-written websites. (Those that know me will know that I’ve been trying to work to get the site updated / rewritten). If it is your practice, please pray for us in the Scottish Episcopal Church. It’s a small church, and I have good friends on both sides of the potential divide. Over many years I have worshipped in both evangelical and liberal congregations and have recognised a great deal that one can teach the other. I pray most fervently that we may be able to live together and continue the dialogue. What an incredibly joyful Easter Vigil we celebrated last night. I always find moving the opening ritual of that service: the lighting of the fire, and of the Paschal candle from that fire; it’s procession into the darkened church building (“Behold the light of Christ”) and the singing of the Exsultet as the light spreads throughout the church building, first to the candles that the congregation and holding, and then to candles on the altars and around the building. We renewed our baptismal promises, gathered around the font. I’ve seen this bit happen too often where we simply sit in our pews and make it all a cerebral activity, a conscious, mental decision to turn to God. But baptism is a sacrament, an outward expression of an inward grace. It is about being cleansed. It is about passing through the waters of death and being born anew in Christ. So we gathered around the font, into which I poured a healthy amount of water from an earthenware jug. What power there is in water as a symbol, even just a relatively small amount like that; the sound as I poured it into the matching earthenware bowl within the font, the feel of the water on our faces and hands as I liberally sprinkled it on the congregation gathered, at the end of the renewal of our baptismal vows. It was a powerful reminder, and it felt so good to be acting out something and adding depths of meaning to something that could so easily have been just another mindless repetition of words. It wasn’t without incident/hiccup, however. We didn’t have a server, for a start, to keep me right; our usual and very faithful server had to call off at the last minute as she’s come down with some nasty chest infection. So, I got outside to light the fire and in the process of making sure that everyone had their hand-held candles I realised that I didn’t have my candle: the Paschal candle. It was still sitting on top of the vestment cupboard in the vestry! There is a light above the door to the church building, which was most useful for reading the prayers as we blessed and lit the fire and traced the alpha and omega (reminding us that God is the first and last) and the current date on the candle. However, just as soon as I was about to insert the first of five incense grains into the candle (to represent the five wounds of Christ) the light, for no obvious reason, went out. The congregation gathered around the fire giggled, as I fumbled around for the prepared holes in the candle. I felt like Fr. McGoo! When we reached the Eucharist, Brenda (the deacon) and I had to juggle a few roles between us, that of priest, deacon and server. Brenda prepared the altar while I swapped my cope for a chasuble. There was then a bit of commotion in the congregation as one member noticed that the bread and wine were sitting on the table at the back of the church building, but her neighbour wouldn’t let her passed thinking that she was nudging her to express how delighted she was at singing such a rousing hymn. Once we had the altar prepared (at last!) Brenda retired to the vestry to retrieve the thurible (Oh yes! we had smells and bells last night!). I stood patiently beside the altar as the final verse of the hymn died away and silence descended. I watched through the gap in the door as Brenda walked back and forth across the vestry. After what seemed an age, but must only have been 20 or 30 seconds Brenda emerged from the vestry with the thurible in hand and whispered something to me. I paused for a moment before moving over to the top of the chancel steps. “Erm … who has the incense?” I asked. People started looking around them and one rather embarrased member of the congregation, who was sitting next to my wife, Jane, stepped forward. She had taken hold of the incense boat while Brenda and I were juggling thuribles and paschal candles in the dark earlier and had just taken it to her seat. But in a way, none of that mattered. What mattered was that we were there and that we were joyfully giving thanks for the resurrection of Jesus. And what a celebration! I felt so uplifted and encouraged that we were in touch with something and someone real. The resurrected crucified Christ was present with us as the 11 of us gathered in that place. Alleluia! Posted on Sunday 27 March 2005 Friday 9 February 2018 Categories God ProjectTags God ProjectLeave a comment on Alleluia! He has risen!